Easy to make potato pancakes are perfect eaten for breakfast, lunch, or dinner. This March may still be on the cooler side, so warm and hearty meal ideas that are beneficial to eye health are a must! This recipe courtesy of FYidoctors patient Van Schepdael is packed with nutrients. Flax seeds contain omega 3 fatty acids, which may help protect against dry eyes, macular degeneration, and even cataracts. The vitamins and nutrients found in eggs, including lutein, vitamin A, and zinc, promote eye health and functionality. 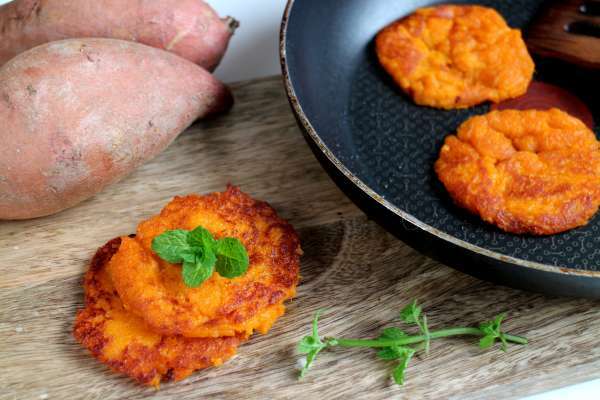 Sweet potatoes on their own are an excellent source of vitamin A in the form of beta-carotene. Vitamin A helps protect the surface of the eye and plays a role in decreasing the risk of vision loss from macular degeneration. Due to their low glycemic index, whole grains, such as oats, help reduce your risk for age-related macular degeneration. The vitamin E, zinc and niacin found in whole grains also help promote overall eye health. And last but not least, the berries as a topping give you the added benefits of vitamin C, which may reduce the risk of cataracts and macular degeneration. Blend all ingredient together with a hand blender. Cook in frying pan sprayed with non-stick spray on medium-low temperature. These take longer than a normal pancake, so be sure to watch them cook carefully. Flip when solid enough to get a spatula underneath. Serve topped with fresh berries and yogurt. For more delicious eye nutritious recipes, check out our blog.